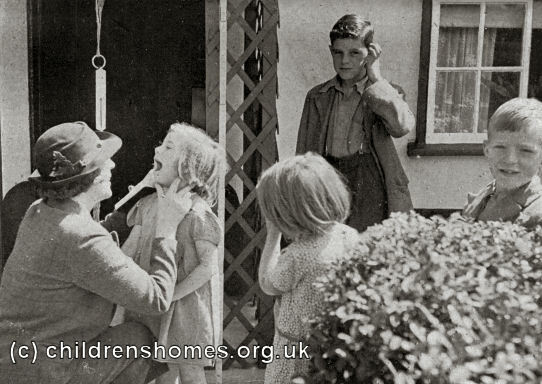 Boarding-out, or what we would now usually refer to as fostering, had its origins in Scotland but by the 1880s was becoming more widely used by organisations involved in child-care such as workhouse authorities. In 1887, Thomas Barnardo — recognising the benefits of boarding-out both for the children themselves and for relieving the pressure on places in his homes — placed 330 boys with families in "good country homes". Those he chose for boarding-out were the younger ones, aged five to nine, who he felt suffered most from institutional care. The scheme was also limited to "orphans", although this was a term he interpreted rather broadly as having one or both parents dead, or with both parents being deemed unsuitable. The foster-parents, all working-class, were given a payment of five shillings a week for each child. They were required to have adequate accommodation that offered "satisfactory sanitary conditions, pure moral surroundings, and a loving and Christian influence." They also had to sign a lengthy and detailed agreement as to how the children were to be treated. Regular inspection of the children was originally carried out by a specially employed female physician, with nurses later taking on the role. The experiment proved a success, with the children settling in well and, with a very few exceptions, receiving satisfactory reports with regard to their health and educational progress. Boarding-out was also cheaper than the cost of institutional care and had economic and other benefits for the foster-parents and their communities. As a result, the scheme was expanded and by 1892, more than two thousand Barnardo children were being boarded out. Financial problems within the organization led to a fall in numbers in the 1890s, but by the time of Barnardo's death in 1905, over four thousand children were being fostered, about a quarter of those being in Canada. One of the few complaints about the system was that on reaching the age of fourteen, children had to move back to one of the central homes to receive industrial or domestic training. In 1889, Barnardo set up a pioneering scheme to board out illegitimate babies near to where their mothers were working. The unwed mother, who must have proved herself respectable and hard-working since her one mistake, was required to enter domestic service with an approved employer and could visit her child on her weekly half-day off. The mother shared the cost of the child's boarding-out and the employer also received a payment from Barnardo's. If the mother failed to make her payment, the arrangement would be terminated and the child would go to an institutional home.